Ralph Valenzisi was appointed Chief of Technology, Innovation and Partnerships for Norwalk Public Schools in 2013. His responsibilities include areas such as educational technology, professional development, creation and supervision of new programs, and creating partnerships to enhance the student-learning environment. Valenzisi was formerly the vice president responsible for information technology at Global Partnership Schools. His experience in K-12 educational and instructional technology has spanned over 15 years. 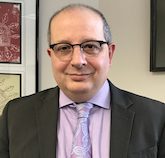 Previously, Valenzisi served as Director of Technology for Norwalk Public Schools, and Educational Technology Coordinator for New Haven Public Schools. He also functioned as a faculty member at the University of New Haven, teaching educational technology to graduate students. Valenzisi was an educational technology consultant for Imperial Software in New York. He was also a classroom teacher for nine years in Stamford. Ralph’s degrees include a Bachelor of Arts from DePaul University, Master of Science from the University of Bridgeport, and Sixth-Year Diploma in Educational Administration from Southern CT State University.